Recognizing the need to strengthen and sustain this unique neighborhood, local community leaders and property owners formed the Castro/Upper Market Community Benefit District (CBD) in 2005. The CBD, which is run by an appointed Executive Director and an elected Board of Directors consisting of residents, community activists, business representatives, and property owners, meets monthly to respond to neighborhood issues such as street safety and cleanliness, and to directly influence land use, economic development, and future planning in their area. 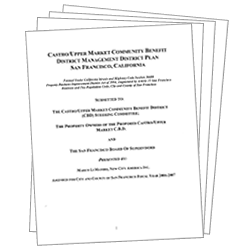 Funds raised through a special property tax assessment in the Castro/Upper Market area are used to finance a wide variety of services including daily sidewalk cleaning and graffiti removal, a streetscape improvement plan, a business attraction campaign, enhanced safety services, support of community festivals and special events, and beautification of the district. The CBD believes that a clean, safe, cared-for neighborhood with stable, vibrant businesses and beautiful public spaces will advance the quality of life in our district and our city. The Castro/Upper Market Community Benefit District is working collaboratively to honor the Castro’s important past, enhance its present quality of life, and secure its future.